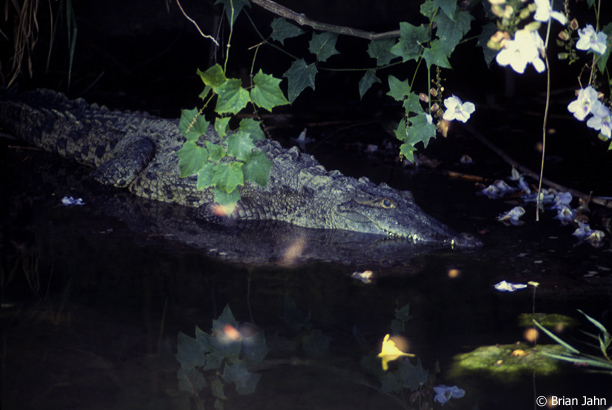 A Jamaican crocodile at Black River on the south coast. Crocodiles (Crocodylus acutus) are found in many places in Jamaica.They are found mostly along the southern coast in wetland areas like swamps and mangrove forests. The crocodile also play an important role in Jamaica’s history and folklore. It’s image adorns the Jamaican coat of arms and is on many of the governments official seals. Hunted until 1971, crocodiles are now a protected species in Jamaica and harming one can bring a hefty fine of US$100,000 or a year in prison. While there have been few reported attacks on people, this year in Black River a 70-year-old woman drowned after being grabbed from the river bank and pulled into the water. Goats and pets have also been known to occasionally disappear. These reptiles can get pretty big, the largest ones growing over 20 feet and weighing more than a ton. Crocodiles in Jamaica today suffer from loss of habitat due to development and it’s estimated they have lost about 50% of their native wetland habitat. Black River was a busy sea port in Jamaica from the 17th-19th century and as a town it was rivaled only by Kingston. In the 1700’s West African slaves were auctioned and traded from its wharves. Because it was one of Jamaica’s major ports it became a fairly wealthy city, exporting sugar, rum, pimento and logwood, (logwood was used to make dyes) to England. In 1893 Black River became the first town in Jamaica to have electricity and later was the first to have the car and the telephone. Black River today is a Jamaican National Heritage site. I recommend the boat tour if your ever in the Black River area, it’s a nice relaxing trip up the river and you might even get a chance to swim with the crocs. I did it and managed not to get eaten. Glad you didn’t get eaten up Brian! it is very inresting to found out about our crocodile.